In heavy-duty industrial worksites, there are plenty of situations that managers want to prepare for. One of the most common is worker fatigue, as working on hard cold surfaces for prolonged periods of time can affect even the most-skilled employee. However, finding a mat that will hold up against all of the hazards of industrial locations can be difficult. The Workplace Depot is proud to offer a solution that provides comfort while remaining durable throughout the entirety of a project. 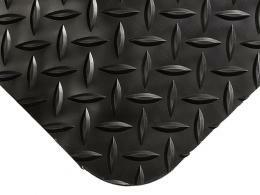 Rubber floor mats, such as anti fatigue mats or anti slip mats, are a great choice for a variety of work areas. 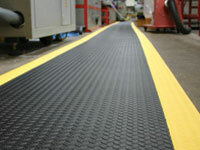 What is the Purpose of Heavy Duty Antifatigue Matting? Heavy Duty Antifatigue Matting is designed to provide the comfort workers need in a way that can hold up with the demands of industrial worksites. This product is a great choice for heavy-use, mainly dry work areas. With a plain black design and optional yellow edges, this checkered product is a great fit in any professional location. By providing protection against slips, fatigue, and floor damage simultaneously, this product has many benefits. This product can be used at any worksite where the conditions aren’t as perfect as management would like. Whether current mats cause slipping or simply become worn down due to the intense work environment, this type of matting can serve as a suitable alternative. 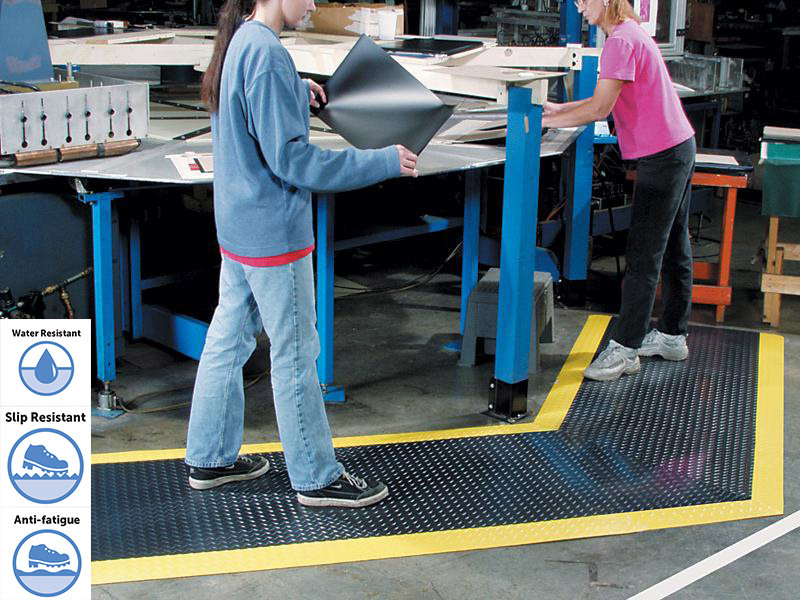 Engineering, mechanical, and construction sites can all enjoy safer and more comfortable conditions with industrial floor mats. Managers are always looking for economical ways to grow their business. One of the best ways to complement any team member’s potential is to give them a better environment to work in. Any member of the team will benefit from using this type of matting. This matting is 14mm thick and utilizes ramped safety edges for an even fit on any floor. 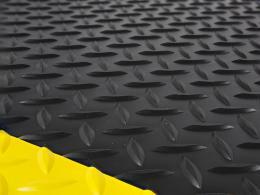 Improve your worksite with Heavy Duty Antifatigue Matting today!